[Other] #Capture all with 48MP, come & find the Bunnies! [Q&A] In redmi note7 why only the right speaker working?the left is for? [Discussion] HOW TO HIDE REDMI NOTE 7 NOTCH? 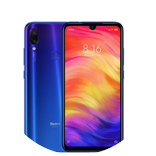 [Discussion] How do you want to destroy Redmi Note 7? [Review & Unboxing] [Mi Product Review #239] Redmi Note 7 Pro: The Real 48MP Beast!